Murano glass chandeliers originate from the Venetian island of Murano, where glass makers have been renowned for their work since the 13th century, producing glass that has long held the reputation of being the finest in the world. Murano glass is made of soda crystal, which gives it spectacular refractive qualities, making it dazzling to behold in the light. Soda crystal is also light and thus able to be worked by the glass makers into intricate and beautiful shapes. In the 18th century Murano glass makers began producing chandeliers that came to be seen as a symbol of wealth and status, often used in decadent settings such as theatres and palaces. Traditional Murano chandeliers would feature complicated arabesque of fruit, flowers and leaves, and glass makers would often incorporate coloured glass. Although these chandeliers declined in popularity for about 50 years during the 18th century, they saw a revival in the 19th century and remain Murano’s most important export. Towards the end of 20th century Murano chandeliers have changed to reflect the modern era. 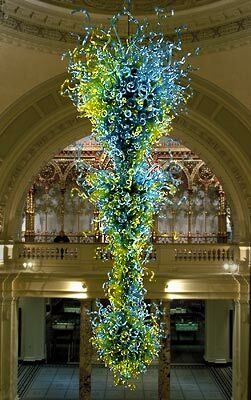 One iconic example is the chandelier by Dale Chihuly that is displayed in the main entrance of the V & A museum. The way it hangs beneath the V & A dome is reminiscent of coral beneath the ocean’s surface- its bright colours of blue, green and yellow glass composed into swirling tendrils. It epitomizes the unique modern Murano glass chandeliers, which are bolder in style and, though they don’t have the traditional delicacy, are no less captivating in their dramatic appearance.